One of our blogging team at Insuremyholiday.ie recently enjoyed a family holiday in England that included a couple of days at Legoland in Windsor – one of the top theme parks in the UK. It was a fun-filled time that big children dad and mum enjoyed every bit as much as the three-year-old in tow. It’s already got them thinking about doing something similar next year. 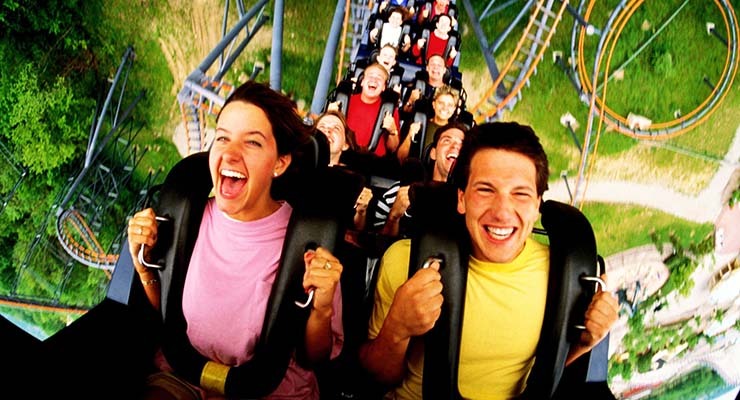 They’ve a lot to choose from, because the UK has a great variety of theme parks, suitable for people of all ages. Where better to start than the one we’ve just mentioned! Legoland is within easy reach of London. It has rides to suit everybody (many have no height restriction at all, and others are just 0.9 metres and 1 metre). There are also lots of shows to enjoy (the pirate one is particularly spectacular), and hugely impressive Lego displays throughout the park too (big child Dad was particularly taken with the Star Wars exhibition). Attractions are added regularly, and new for this year is a ride based on the popular Lego Ninjago series. It’s highly recommended. Thorpe Park is another in easy reach of London – but unlike Legoland, it’s set up to give adrenaline rushes galore. It’s got some of the highest and fastest rides in all of Europe, including ‘The Swarm’ – a rollercoaster where riders are dragged into a blind 127ft drop and which is definitely not for the fainthearted! Derren Brown’s Ghost Train is a new attraction there, and is hugely enjoyable for all who like a bit of a scare while having fun. Alton Towers is possibly the best known park in the UK for roller coasters and other adrenaline-filled thrills, and for good reason. With names like ‘Nemesis’ and ‘Oblivion’, you know that the rides there aren’t going to be just a gentle jolly! Younger children are catered for too, with the new CBeebies Land, featuring many favourites from BBC TV. Drayton Park is enough to Alton Towers to comfortably visit both parks on the same trip. Of, if it’s a choice of one or the other, this is the one to opt for if your children are younger. It’s best known for Thomas Land (dedicated to Thomas the Tank Engine), while for slightly older children, Ben 10 is a popular theme. Also worth noting is that admission here is free for children up to the age of four – unlike most theme parks, where it’s free up to the age of three only. Oakwood in West Wales is particularly accessible for people from the south-east of Ireland. It’s just a short drive from either Pembroke or Fishguard if you take the ferry from Rosslare. It’s home to some super thrills, including ‘Vertigo’ (where you’re shot upwards into the air, in a sort of reverse bungee jump) and ‘Megafobia’ (voted best roller coaster in the UK, and third best in the world). Among the attractions for younger children are the pirate-themed ‘Neverland’ and ‘Hook’s House of Havoc’. Finally, it’s not a theme park as such, but don’t forget the ever-popular Blackpool Pleasure Beach if you’re bound for Manchester, Liverpool, or anywhere else around the north-west of England. It’s been a favourite with visitors for well over 100 years now, and you’re absolutely guaranteed to find something for everybody to enjoy – from gentle roundabouts for the smallest children, to roller coasters for thrill-seekers, and even bingo for the more sedate older folks. And there just happens to be a beach nearby too! If you and your family are bound for the UK – to take in a trip to a theme park, or for any other reason – then make sure you take out Family Travel Insurance before you go. It can be easy to overlook Travel Insurance for what you might see as just a short hop to the UK. But remember – there’s as much chance of somebody having an accident there, or something else going wrong, as there is anywhere else. That’s why carrying Family Travel Insurance is so important. Family Travel Insurance from Insuremyholiday.ie is the best value you will find – because when you take out insurance for mum and dad, the kids can go for free! * This applies to both our Single Trip Travel Insurance and annual Multi Trip Travel Insurance policies.